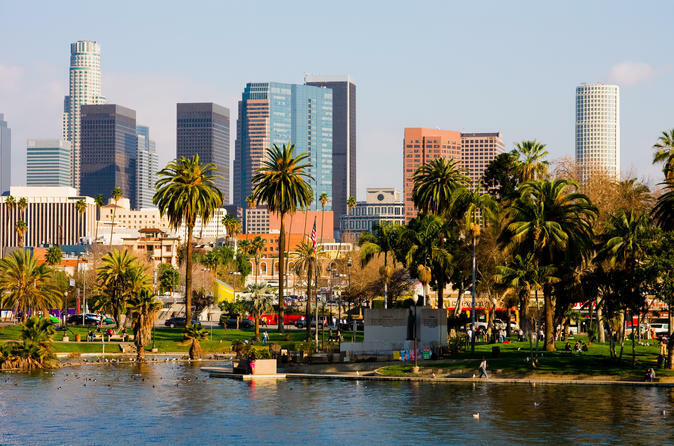 Get an overview of Los Angeles on this 5.5-hour coach tour with an informative guide who provides commentary and fun facts. See the Hollywood Walk of Fame and the Hollywood Sign, travel along the Sunset Strip, and visit downtown LA. You’ll make stops at popular landmarks like the TCL Chinese Theatre, Rodeo Drive, Hollywood Bowl, La Brea Tar Pits, Olvera Street and Walt Disney Concert Hall. Free time at The Grove shopping center next to LA’s historical Farmers Market is included. Choose either a morning or afternoon tour. Only the morning tour is offered as multilingual. The afternoon tour is English only. Hop on the coach and meet your guide, who provides interesting and amusing commentary about Los Angeles and its movie history throughout your sightseeing tour. Start on Hollywood Boulevard, where you'll see the 200 cement handprints at the TCL Chinese Theatre, stroll down the Hollywood Walk of Fame and pass by Dolby Theatre, home to the Academy Awards. Cruise along Melrose Avenue, down the nightclub-strewn Sunset Strip and past the famous landmarks of Beverly Hills. See the Miracle Mile, which stretches over several blocks on Wilshire Boulevard, home to the LA County Museum of Art, and hop off your coach to explore glitzy Rodeo Drive on foot. Next, view the highlights of downtown Los Angeles, including Chinatown, the Staples Center, Our Lady Cathedral and the Nokia Theatre located at LA Live. Enjoy 10- to 25-minute stops at Olvera Street, site of Avila Adobe, dating back to 1818; Walt Disney Concert Hall, designed by renowned architect Frank Gehry; and La Brea Tar Pits, known for its Ice Age fossils recovered from natural asphalt deposits. Your tour includes a 1-hour stop at The Grove and The Farmer's Market, which boasts more than 140 shops, restaurants, markets and cafes where you can grab some lunch or snacks (own expense). It’s located next to the Farmers Market, LA’s largest open-air market, founded in 1934. Your tour ends with either hotel drop-off or return to the starting point on Hollywood Boulevard.